“Hopefully, we will complete this operation in a very short time,” he told a political rally in the city of Bursa. 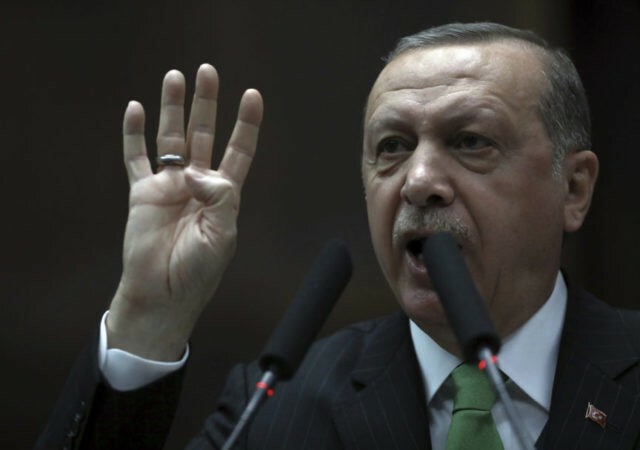 Erdogan had harsh words for the Kurd-friendly opposition Peoples’ Democratic Party (HDP) Party, which has called for protests against the operation in Syria’s Afrin province. The authoritarian Turkish president quickly suited actions to words, ordering judicial investigations of two HDP leaders who posted Twitter messages critical of the assault on the Kurds. “Attempt to invade Afrin means an all-out attack and war against the Kurdish people. Silence is to accept dishonor. It is time to go into action,” tweeted one HDP member of parliament, Nadir Yildirim. “Despite the fact that there is no attack from Afrin against Turkey, an operation on Afrin will drag the country into a civil war should it succeed and prepare the ground for a coup should it fail,” warned another, HDP chief Ayhan Bilgen. Both were accused of “inciting people to hatred, animosity, and crime” for their tweets. Another opposition leader, Democratic Society Congress (DTK) Party co-chairwoman Leyla Guven, was charged with a similar offense for organizing a demonstration outside the HDP Party headquarters in the city of Diyarbakir on Saturday. The demonstrators were reportedly told their protest was not permitted because a “state of national emergency” is in effect. Technically, Turkey has been in a state of “national emergency” since the failed coup attempt against Erdogan in June 2016. The Erdogan administration recently announced plans to extend the state of emergency for the sixth time. Turkey has been shelling Kurdish positions around the city of Afrin for the past three days. On Sunday afternoon, the Turkish military announced it has also conducted airstrikes and moved ground forces across the border into northern Syria. “Operation Olive Branch is ongoing as planned and the ground operation has started,” the Turkish military stated. “We’ll work this out,” he added, without specifying the official U.S. reaction to Turkey’s action. Mattis claimed that Turkey has “legitimate security concerns,” while also praising the Kurds and other U.S. battlefield allies for their fight against the Islamic State (ISIS) in Syria. “They have proven their effectiveness. It has cost them thousands of casualties. But you have watched them, with the coalition support, shred ISIS’ caliphate in Syria,” he said, stressing that the U.S. military is carefully monitoring how the weapons issued to its Syrian allies are used. “We call on all parties to remain focused on the central goal of defeating ISIS. Now is the time for great nations to work together to secure a peaceful stability for the people of Syria,” the State Department added. Secretary of State Rex Tillerson reportedly spoke with the Russian and Turkish foreign ministers over the weekend about the Afrin situation. Turkey is a member of NATO, and has occasionally talked about invoking Article 5 of the NATO charter to demand assistance from other member states when it comes under attack from factions in the Syrian civil war. This raises the uncomfortable prospect of Turkey demanding U.S. military intervention against the Kurds who did much of the frontline fighting against the Islamic State with America’s support. The Kurdish-led Syrian Democratic Forces General Command said that at least eight people were killed by Turkish airstrikes and artillery attacks on Afrin. The People’s Protection Units (YPG) returned fire with rockets against the Turkish border town of Reyhanli on Sunday, reportedly killing at least one person, identified as a Syrian national by Turkish media. Another rocket attack that was not officially claimed by the YPG struck the Turkish border city of Killis on Sunday, injuring one person and damaging some buildings. “We have no choice but to resist. We call upon all of our young people to meet in the ranks of resistance, taking the resistance spirit of our sacrificial martyrs as an example,” said the YPG. As for the Syrian government, it warned on Thursday that it was prepared to shoot down Turkish aircraft operating in its airspace. “We warn the Turkish leadership that if they initiate combat operations in the Afrin area, that will be considered an act of aggression by the Turkish army,” the Syrians said. Syrian President Bashar Assad denounced the assault as “Turkish brutal aggression on the Syrian city of Afrin,” according to Syria’s state-run media.